Announcing the release of this new BWB Text by Anne Salmond, which is now available from the BWB website and global e-bookstores. 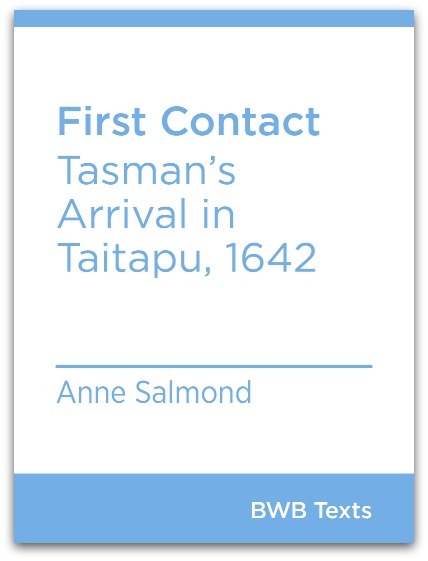 With the publication of her book Two Worlds, Anne Salmond introduced a penetrating rewriting of our traditional views of first contacts between Māori and European worlds, helping us to see these meetings with fresh eyes. In this account of the dramatic visit of Abel Tasman’s Dutch ships to Golden Bay in 1642, Professor Salmond shows how giving equal weight to both sides of the encounter can shed fascinating new light on the actions and motives of both parties. Anne Salmond is Distinguished Professor at the University of Auckland. One of New Zealand’s most prominent anthropologists and historians, Professor Salmond is the author of the award-winning works Two Worlds: First Meetings between Maori and Europeans, 1642–1772; Between Worlds: Early Exchanges between Maori and Europeans, 1775–1815; The Trial of the Cannibal Dog: Captain Cook in the South Seas; Aphrodite’s Island: The European Discovery of Tahiti; and Bligh: William Bligh in the South Seas.